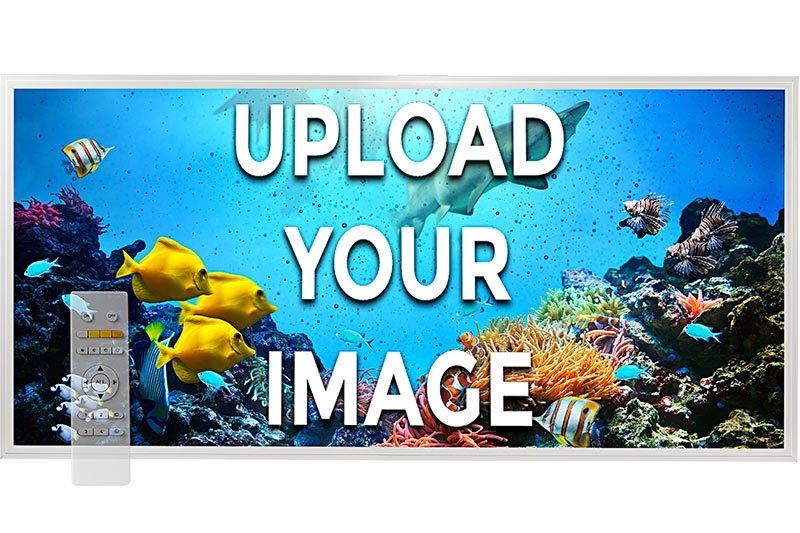 Create a vibrant LED ceiling display using your own custom images. This 2' x 4' Tunable White LED Skylight features adjustable color temperature from 3000K-5000K. The printed LED panel light is a quick and easy alternative to traditional window skylights and is designed for use in drop ceilings. It's great for offices, schools, hospitals, gymnasiums, basements, and other applications where it's beneficial to mimic natural daylight cycles. Color temperature and brightness can be controlled with an optional remote (sold separately). The image is printed directly on the 2' x 4' panel diffuser. Photo submissions can range from cloud and treetop images to company names, logos, and advertisements. This backlit panel light uses Even-Glow® technology, which consists of a light-guide plate and an optical diffuser, to deliver smooth illumination without visible bulbs or hot spots. The 72-watt LED skylight operates on 100-277 VAC, has a sturdy white aluminum alloy frame, and is designed to last at least 5 times longer than fluorescent panels. Price per skylight.